I could go for weeks, months, years without eating Chinese food (the gloopy Westernised stuff anyway, rather than the eye-opening dishes served up by Memories Of Sichuan). I can take or leave a burger: they’re great when you’re in the mood, but they’d rarely be my first choice. I enjoy Indian food but, with the exception of Namaste Kitchen, I’ll eat it mainly when it’s suggested by somebody else. But one thing I do love – properly love – is a really good pizza. It does have to be good: none of your deep pan gubbins with Day-Glo pepperoni please, and no ham and pineapple nonsense. I don’t want a stuffed crust, barbecue sauce drizzled over like chocolate sauce, or crispy duck weirdness. I want a light base, a bubbled crust, good tomato, great mozzarella and a simple, classic topping. Ideally anchovies, capers and black olives: I order it as a test the way curry fans might go for a butter chicken or a lamb bhuna, a reference dish. I’m always on the lookout for the perfect pizza and, equally importantly, the perfect pizza restaurant. In Paris it’s Le Briciole, on the edge of the Haut Marais, dark and dissolute, frequently a tourist-free zone and perfect for a lunchtime carafe, pizza, burrata and a chance to observe Parisians being, well, exactly that. I go every time I visit the city. In Helsinki it’s Linko, in the residential district of Toolo, a tiny place with fewer than twenty seats full of people enjoying unfussy pizza and the relative novelty of grabbing a bottle of wine without having to flog a kidney first. 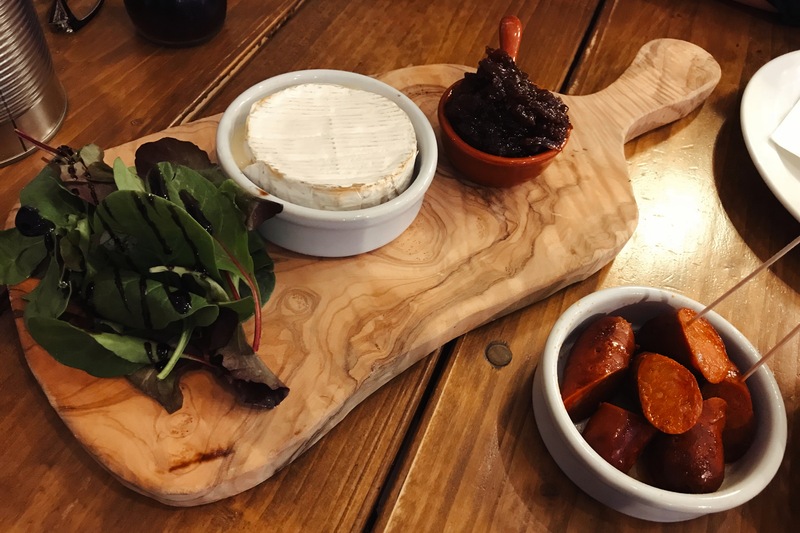 Closer to home, there’s Bristol’s Bosco, sleek, black and full of delicious charcuterie and cheese before the main attraction arrives. In the edgier part of the same city, there’s Flour And Ash, where you sit at what look like reclaimed pub tables and the base is spread with ox cheek ragu. Or Lewes’ sadly departed The Hearth, in a converted former greasy spoon above the bus depot, all formica tables and old music on the jukebox. Heaven, I sometimes think, would be like a long drawn-out lunch in such a place. In Reading, for a long time it was Papa Gee or nothing (except the chains and – err – Zero Degrees), and then along came Franco Manca. Franco Manca, although it isn’t perfect, has enough going for it that you don’t much mind. It’s quick and convenient, sometimes quite good, sometimes excellent. If you sit in the right place you can’t see all the way through to Debenhams (the Reading branch of Debenhams was once voted the worst shop in the United Kingdom – by Daily Telegraph readers, no less). Good though Papa Gee and Franco Manca are, they don’t quite match up to the ideal of that little, bustling place turning out brilliant pizzas, full of conversation and people-watching. That’s where Newbury’s Lusso comes in. It started out serving from a van in town, before graduating to permanent premises offering sourdough pizzas and gelato and not a lot else. I always warm to a restaurant that only wants to be very good at a few things, and I’d had good reports from a number of people. One was my friend Izzy, who ought to know because she works in Newbury, so I met up with her one evening to try it out for myself. Newbury’s a lovely, quiet market town with much to recommend it. An excellent beer, wine and gin shop. A good sushi joint. A cracking butcher on the bridge, selling splendid sausages. A micro-pub and a number of snug, cosy boozers (the King Charles Tavern is a favourite of mine, especially in winter when the fire’s on). I can confidently add the gin bar of the Catherine Wheel to that list. Izzy and I stopped there for a pre-prandial drink and discovered a gigantic selection of gins – over a hundred, I seem to recall – all at a single price that would (or should, anyway) make the Thames Lido blush. My black tomato gin was fresh and green with a sprig of thyme, Izzy had a classic bone dry gin from Berry Bros and we started to catch up on everything that had happened since I saw her last. I noticed that the Catherine Wheel did a full range of Pie Minister pies and was tempted to dally, but we headed out to Lusso only a gin to the good: pizza one, pie nil. Lusso is in the quaintly named “Weavers Walk”, just off the main drag, facing on to a courtyard which will no doubt be lovely in summer. It’s a small, plain room with probably no more than 30 covers – tables for two and four down either edge, and tables and benches along the middle which can be put together for communal dining (a large group sat there not long after we began our meal). Everything was tasteful – pastel but not twee – although the tiled walls and the lack of any soft furnishings meant the place got very loud. I wouldn’t have guessed that when it was just Izzy, me and a family of four at another table, but by the time we left all but one table was occupied and we’d gone beyond buzz to full-on hubbub. There was an open counter at the back which meant you could see your food being assembled and cooked: at first it was alarming to see nobody there, but before too long the chef wandered through with a tray of pizza dough, ready to be stretched and shaped for the orders that lay ahead. I took against the menu by virtue of it being in Comic Sans – this can’t just be me – but it made all the right noises. A few nibbles, a handful of starters, a burger and some salads (presumably for those rare individuals who go to a pizza restaurant and say “not pizza again”) and the main attraction, nine pizzas and a range of toppings if you wanted to customise. Pizzas were twelve pounds, so expensive compared to the likes of Franco Manca but not far off Pizza Express. Nonetheless, font notwithstanding, it’s hard not to like a pizza menu which features nduja but doesn’t have pineapple anywhere to be seen. 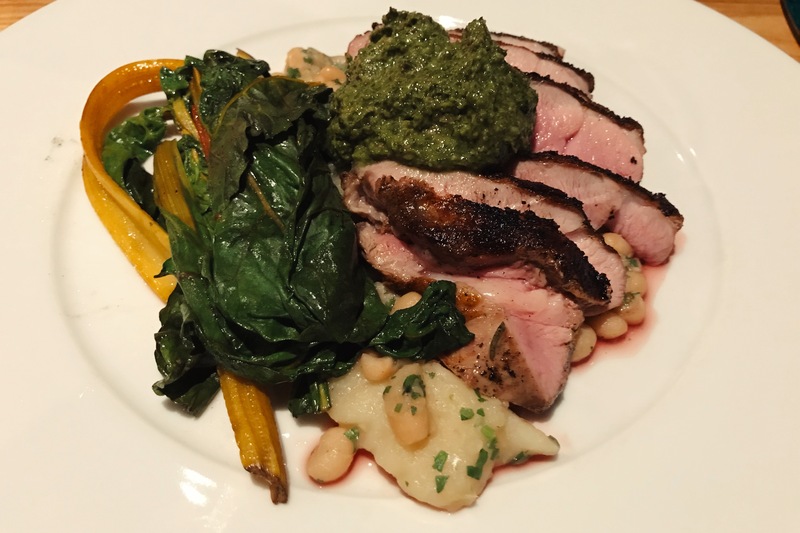 We started by sharing some nibbles, which gave me my first chance to see what Lusso was good at – and, as it turned out, less good at. A dish of grilled chorizo sausages was exactly that, nothing more and nothing less. It looked like it would be horrendous – three little sausages cut into halves and dished up with a couple of cocktail sticks – and I was relieved when I tried some that the chorizo was good quality, so what looked like it would be bouncy was in fact juicy. But I still had quibbles – they needed longer, and I’d have liked to see the chorizo in smaller slices. There was no caramelisation on the outside, and almost no oil – one of the best dips there is – had escaped into the ramekin. It didn’t feel like quite enough, for a fiver. The baked Camembert had similar problems – it was on the small side for nine pounds, if nice to share, but it hadn’t been baked long enough to be properly gooey. No thyme, no garlic, no slashes across the top, no attempts at all to gussy it up. A pile of red onion chutney was nice but both literally and figuratively too much, and the salad was too easily knocked off the tiny plank onto the table (which, and I’m not telling tales here, is exactly what Izzy did). The sections of pizza bread it came with were a promising teaser for what was to follow, but it wasn’t the right bread for this kind of dish: you need something you can use to really get into the corners. Our mains arrived with a speed which made me wonder whether Lusso was hoping to use our table again before the evening was out. It was a shame, because before that point I was starting to really enjoy the experience of eating there. We were having a good old chinwag about the things 2018 had thrown us so far, speculating on our fellow diners (“I bet that lot are from Vodafone” said Izzy, referring to the loud, self-satisfied bunch on the middle table) and enjoying our drinks – a very serviceable, fruity Nero d’Avola for me and a Diet Coke, the curse of the driver, for Izzy. Between us we’d gone for traditional and off-piste pizzas – the Times New Roman and the Comic Sans, you could say. My pizza Napoletana, the gastronomic dragon I always chase in pizza restaurants, was extremely good. The base was beautifully irregular and blackened at the edges, although maybe not as bubbled as I’d have liked. I might have liked saltier, wrinklier olives, or bigger, fatter capers, but I couldn’t argue with the quantities. 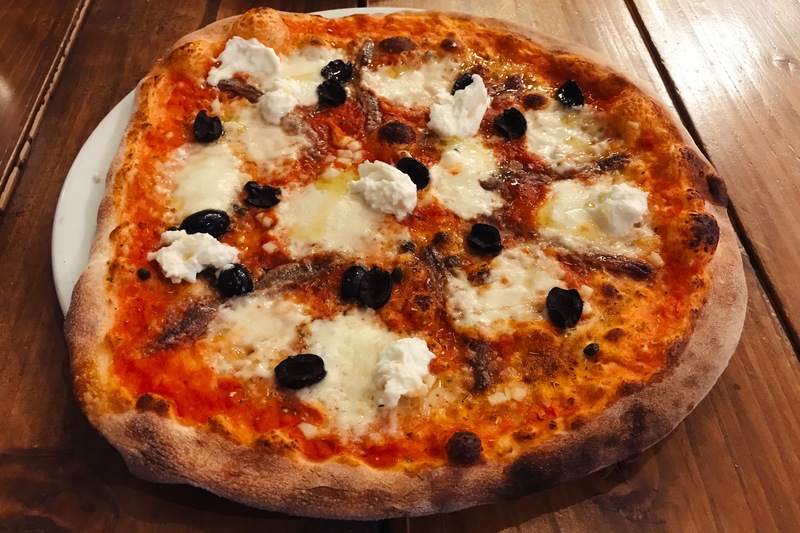 The anchovies were simply astounding, little savoury bombs, as deep and salty as Marmite, scattered across the whole pizza: no experience, like at Franco Manco, of picking which three or four mouthfuls to particularly enjoy. The mixture of melted mozzarella and torn pieces of cold, fresh mozzarella was a masterstroke: why don’t more places do this? I was delighted from start to finish, and even though this was Newbury and not Paris, Bristol or Helsinki, a little bit of me was happily transported. “I normally have the margherita with pesto” said Izzy, “but it can make it a bit oily so I’ve gone for some chicken on there too.” I imagine purists are recoiling in horror at this – chicken on pizza is just below pineapple in Maslow’s hierarchy of crimes against pizza – but I couldn’t bring myself to be shocked. I didn’t try it, but Izzy enjoyed it from start to finish. It had the same great base, the same excellent mix of cooked and fresh mozzarella and the pesto was vivid, verdant stuff. The chicken impressed me less, being big thick uniform slabs that could have come from a catering pack. If I’d thought it had been cooked there, or torn by hand, I’d have been more convinced. But if you did happen to be in the mood for a chicken and pesto pizza – and I suppose some people are, sometimes – you could do far worse. 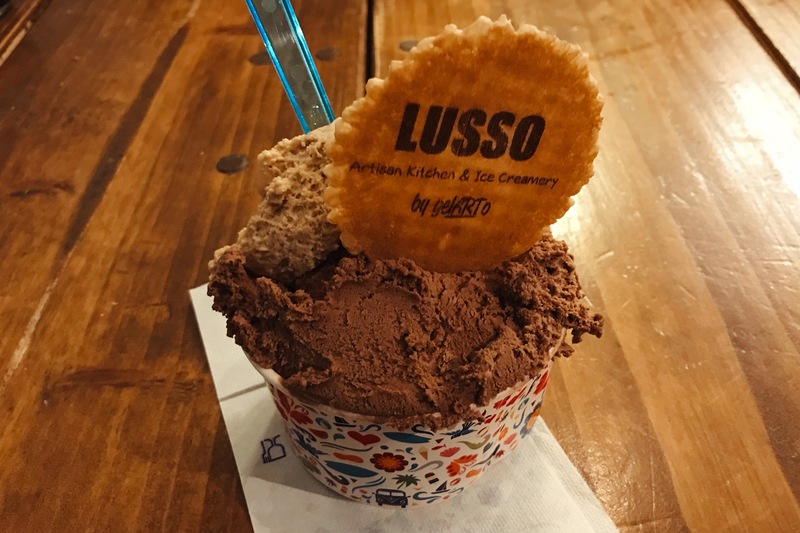 Dessert was compulsory, given that Lusso started life as a gelateria. I’d made the mistake of looking at the ice cream flavours online beforehand – Cotswold lavender and honey! Sicilian pistachio! – but they only stock ten at any one time in the restaurant and the ones on display smacked of playing it safe – chocolate, vanilla, mint choc chip and so on. Not for the first time, I missed Reading’s Tutti Frutti and Paul’s recurring bonkers project to create Barkham Blue ice cream (he never quite got it right). The menu doesn’t actually include the option to just have ice cream, which is a bit confusing, so when we ordered a couple of scoops each they dished it up into a cardboard tub which we took back to our tables, an odd way to conclude a meal in a sit-down restaurant. The salted caramel, as often happens, tasted more like butterscotch, without even a hint of salt: not bad, but not what I’d ordered. I couldn’t help comparing it with my recent visit to the Lido: better on price (£4.20 for two very generous scoops), better for texture, being far smoother and less gritty, but falling down on flavour. Fortunately, the chocolate was much better – pretty textbook, much closer to milk than plain. But ultimately, however good it was, it was still only chocolate ice cream. Izzy tells me her honeycomb ice cream was lovely: I didn’t get any. Service was pleasant and friendly, if stretched towards the end, and any issues with timing in the kitchen really weren’t the fault of the solitary waitress working that night. Dinner for two came to fifty-four pounds, not including tip, and we were done in just over an hour. “That pizza was lovely” I said as I walked Izzy to her car. When a restaurant is out of town, it’s hard to divorce it from its surroundings. Of course you might go there all the time if you lived there, but what if you didn’t? 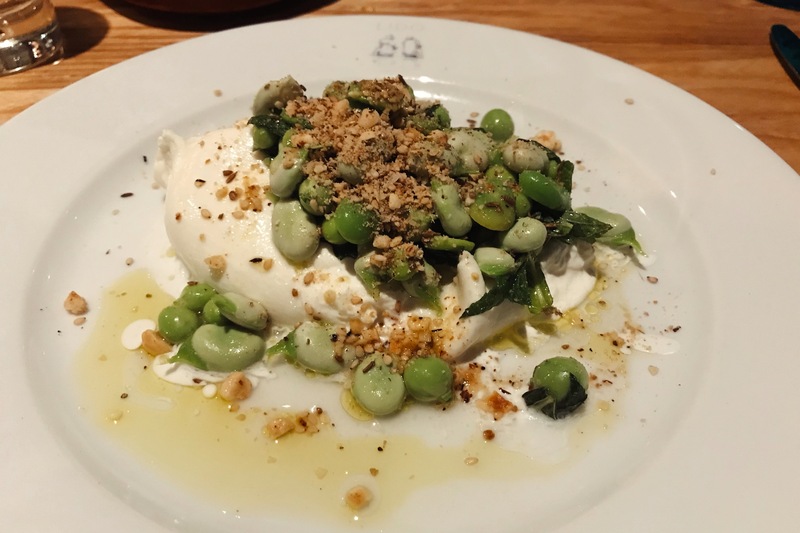 Lusso isn’t quite on a level with all those places I mentioned at the start of this review but, perhaps crucially, it is slightly better than pizza restaurants in Reading. So whether you go probably depends on how much you fancy a trip to Newbury – and, of course, how much you like pizza. That renders the rating almost irrelevant, but for what it’s worth I liked Lusso. I can see myself going back, probably at the weekend for a nice amble round the food markets, more bubbled crust, mozzarella and salty anchovy, a bottle of gin from Inn At Home to add to my collection and a pint or two in the King Charles Tavern before taking the train home. It doesn’t sound like a bad Saturday, does it? Not that I mind: it’s nice that people take an interest, and better to be spoiled for choice with dining companions than to have to ask nicely or, worse still, beg. But some reviewing opportunities are more prized than others, and none more so than Thames Lido. It opened last year, after years of money-no-object, it-takes-as-long-as-it-takes restoration work, extensively catalogued online in a series of beautiful pictures (whatever else you might think of Thames Lido, they get social media right in a way which puts other Reading restaurants to shame). In the run-up, there were glossy pictures and features in the broadsheets, and after it opened it received a blandly positive review in the Guardian (which described it as “just off the Reading ring road” – thanks for that). This is no surprise – the original Lido in Clifton is well-established and well-reviewed and has impeccable connections – but the overall effect is that Thames Lido is probably Reading’s first ever destination restaurant. Just don’t tell anybody it’s in Reading, is the implication, in case it puts them off. So who to take? The decision was made for me when Kat told me, in no uncertain terms, that she was accompanying me. I said yes, because I owe Kat a favour, but she was – on paper at least – an unlikely candidate. Kat has an interesting diet which involves eating sweet and sour chicken balls in the bath, and she’s partial to a battered sausage or a Tesco all day breakfast sandwich. The way this was said reminded me of Rizzo The Rat from Muppet Christmas Carol. Oh well, I had my angle: the irresistible force meets the immovable object, Reading’s destination restaurant meets one of Reading’s most unreconstructed diners. What could possibly go wrong? My misgivings were exacerbated in the run-up to the visit when Kat sent me a message. What have I let myself in for? I thought to myself as I approached the restaurant with Kat, emergency pasty presumably stowed away in her handbag for later. When I say “approached the restaurant” that makes it sound like an easier process than it was, on foot on a gloomy March evening. It’s a little tricky to find an entrance – down the side road without signposts or the main road without pavement? – and one of the entrances takes you in to the restaurant while the other one, the main one I suppose, takes you in to the Lido proper. Even picking the right entrance, it was a bit confusing finding our way to the restaurant (and that flair for signposting, or lack thereof, extends to the bit partway through the meal where you try to find the loo). A minor thing, I know, which only applies the first time you go, but first impressions and all that. The restaurant itself was – as so often – a long thin room, a shape that’s mandated by its position running alongside the pool. The view was spectacular, with steam rising from the heated pool, the fetchingly retro changing booths beyond. The occasional intrepid swimmer bobbed past and, like no doubt everybody who has visited Thames Lido, I was very impressed by the quality of the restoration. It carried through into the furniture – sturdy, handsome tables, generous and roomy for two people, and the kind of chairs you could imagine settling into. It’s a high-ceilinged, airy space and thought had even been put into that, with fabric panels hanging from the ceiling to absorb noise. If you get a table alongside the pool, that’s great. The other tables – like the one we were given – feel far less special and force one of you to forego the view and stare at the bare brick walls. We asked to move as a poolside table came available and they moved us without complaint. The menus didn’t come with us and it took a fair amount of flagging down staff before they reappeared at our table. We started by hitting the gin menu, which is divided up on the good/better/best principle with some at £7, some at £9 and some at £11.50. Yes, you read all those right, and tonic is extra. Only two tonics are available, so you get Schweppes for £1.50 or Fever Tree for £2. That makes most of the gins more expensive than the Lido’s cocktails, and some of the gins are also very oddly priced. I was surprised, for example, to see Gin Mare, readily available in supermarkets and pubs like the Fisherman’s Cottage, on sale for £11.50. Each of the gins had modish tasting notes made up of three adjectives, although how Gordon’s tastes of “historic” is anybody’s guess. Do I sound cross? It’s probably because I was, a little. I’ve been to lots of establishments with gin lists, from pubs to Michelin starred places, and they all make great effort to pair the gins with different mixers, different garnishes, serve them in big balloons so you can almost breathe in the botanicals. Not so at the Lido, where both gins turned up in a highball with ice and lime, nothing more. The Jinzu with Fever Tree (total cost thirteen pounds fifty) was pleasant, light, sweet and floral, but the main thing I thought with each mouthful was just how expensive it was. “Hotel prices”, murmured Kat disapprovingly. The Psychopomp Woden with Schweppes was punchier, a brutal mixture of fennel and grapefruit, and a relative snip at ten pounds fifty. You only got 125ml of Schweppes as opposed to 200ml of Fever Tree, another thing the menu neglected to mention. The gin took a while to arrive, so we grazed on the complementary bread with olive oil. Again, I had heard great things but this was tough going – nicely seasoned but dense and heavy with no light, crispy crust, more murder weapon than appetite whetter. “I was here for the set lunch earlier in the week and the bread was so much nicer” said Kat. “It was warm, soft inside and the crust was brilliant.” I couldn’t help wondering if this was the same loaf, a few days later. The menu managed that rare feat of being interesting and nice to look at without having anything on it that you absolutely had to order. I was expecting some kind of plea bargaining with Kat (and if they’d still had the slow cooked ox cheek in Pedro Ximenez on the menu that might have happened) but as it was, neither of us had a first choice to go into battle for. We eventually placed our orders with the waiter, a rather disengaged man who spent much of his time serving us looking around, as if hoping to speak to someone more interesting (“he’s like a really rude date” was Kat’s observation). I was in the mood for a leisurely evening, but even so I was pleased when the starters made their way to our table. They represented the high water mark of the meal. Kat’s wood roasted asparagus with almond sauce and cecina looked like the kind of dish to provoke full-on food envy: a generous sheaf of asparagus, thinnish spears, with the almond sauce and what looked like jamon, and a hoard of toasted almonds, little grenades of flavour, hidden underneath. 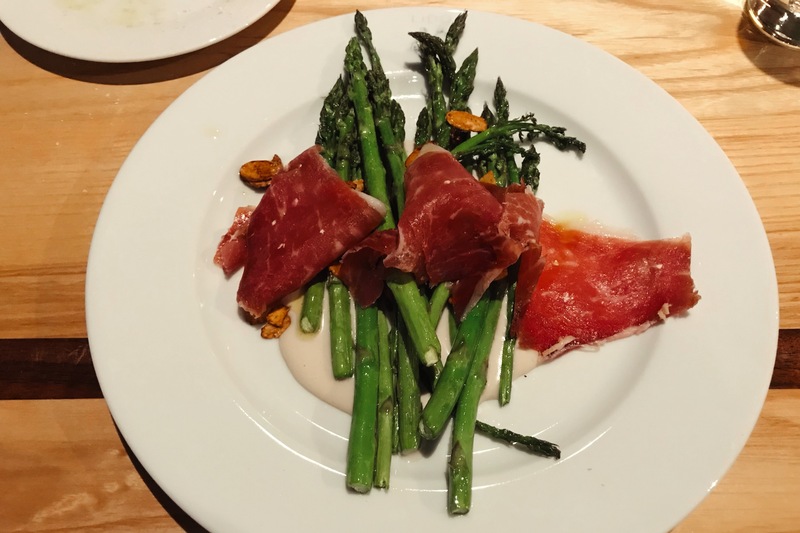 I assume the asparagus was very early season – although it was odd that the menu didn’t mention this – and it was terrific stuff. Kat waxed lyrical about the almond sauce, saying it was salty but with a sweet edge, in a manner which suggested I might have misjudged her after all. If I was being pedantic, I’d say that cecina is normally beef rather than ham, but that hardly detracted from how delicious the dish was. Burrata, if not as good, was still thoroughly enjoyable. Serving it with heaps of broad beans and peas, if anything, made it even cleaner and fresher, a little reminder that spring was just round the corner, even if it didn’t quite feel like it yet. A slightly funkier note was introduced with the liberal dusting of dukkah, which added spice and edge and saved the whole lot from being just a little too nice. I didn’t get the promised yuzu, but it didn’t feel like the end of the world. Our wine arrived almost immediately after I uttered the words “do you know what, I’d really like my wine now” to Kat. The gins were nearly finished (well, you want to take your time on something that expensive), the starters had long since been dispatched and the main courses were about to turn up. It felt truly odd that the wine hadn’t materialised by that point. The waitress who brought them – and served us from that point forward – was considerably more likeable, chatty, knowledgeable and clued up than the chap we’d been talking to before, a clear reminder of the difference between being served and being looked after. We’d gone for a Jeune Musar, a pretty entry level Lebanese red at £33 (although still about a three times markup from retail price) – I liked it, it was nicely balanced and although it started out a little tannic it opened out nicely given a little time. A shame it wasn’t given more time, really. I’d gone for the lamb leg (Pyrenean, no less) and was generally pleased with my choice. The lamb was cooked beautifully – I could have stood it a little pinker, but it was close enough – with a lovely layer of fat and a beautiful salty char on the outside. The beans, some of which I think were pureed or mashed, added a nice earthiness. The salsa verde was packed with parsley and mint and absolutely made the meal; I could have eaten it with pretty much anything. Only the rainbow chard – pretty but tough going – misfired, it felt like it had been added for betterment rather than enjoyment. 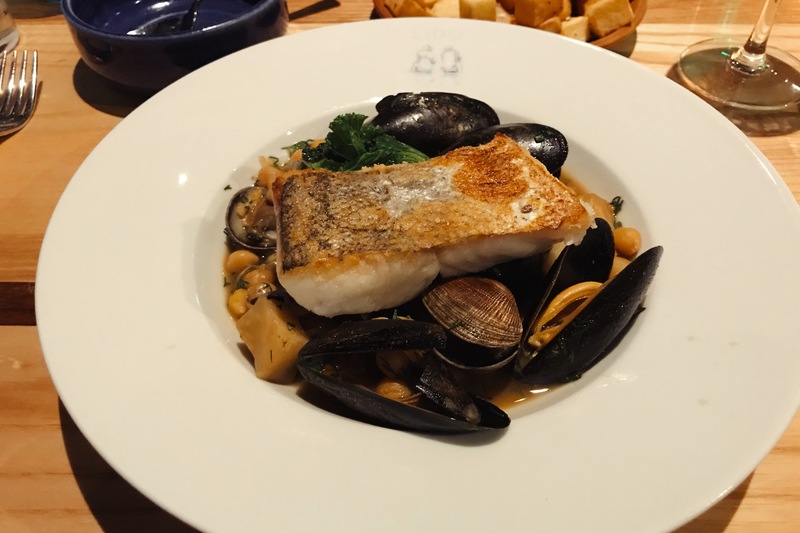 Kat, on the other hand, picked the dud: hake, with mussels, celeriac and saffron broth. The fish was a nice piece but it was underseasoned, with only half the skin crispy. “It’s all a bit bland except the broth”, she said “and that just gets saltier the more you have of it”. I had a taste and couldn’t disagree. Weirder still was the marriage of chickpeas – which you’d absolutely expect in this kind of dish – and lashings of dill, which you just wouldn’t. Dill is a distinctive enough taste that you’d expect it to be mentioned in the menu, but no joy. Kat left some, and Kat – as you can probably tell from the emergency pasty – is not someone to leave food. The side dish I really fancied – cauliflower with lemon and zata’ar – was sold out so we went for the crispy fried potatoes with rosemary and garlic. The taste was good, but the texture felt neither crispy nor fried. It was almost like someone had just lobbed them in a baking tray for half an hour, and there was certainly no evidence that they’d ever seen hot fat. I couldn’t help thinking how much better Honest’s rosemary fries were. I couldn’t even be sure these were significantly better than Café Yolk’s fried potatoes, and they came out of a packet. Again, we didn’t finish them. “If they’d actually been crispy you’d have had to fight me for them” said Kat. The reputation of the Lido’s ice creams precedes it – they make up most of the dessert menu, after all – so it felt almost compulsory to order some to round off the meal. It’s six pounds for two scoops, and although many of the flavours were tempting Kat and I fancied the same ones so we decided to just go for it (with hindsight, the tasting flight to share would only have cost a little more and would have made a better option). They came in beautiful little bowls, and bringing each flavour in a separate bowl was a lovely little touch, because this is an area where you really don’t want to cross the streams. 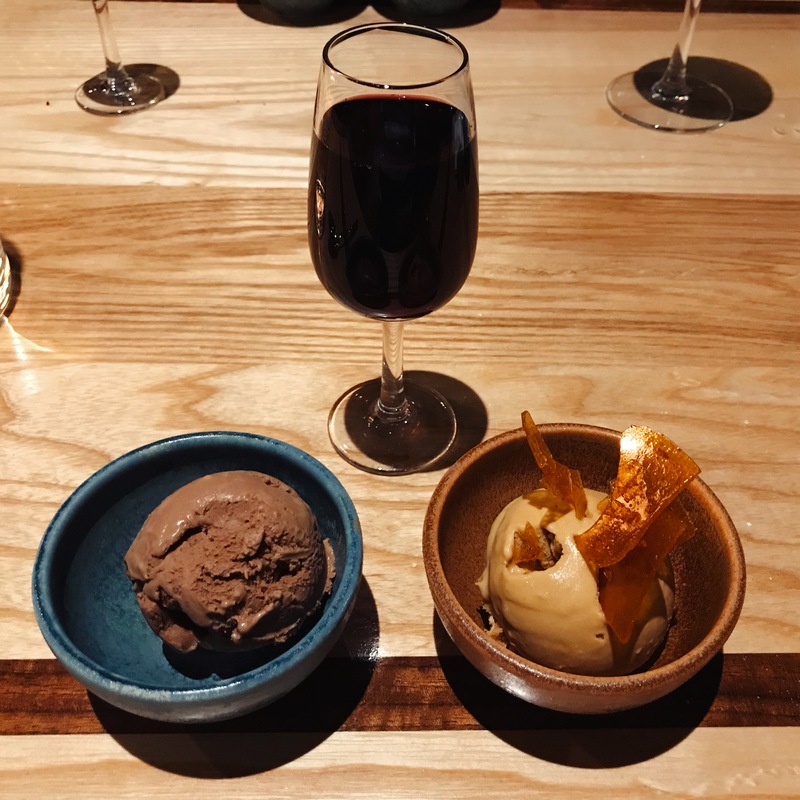 Of the two, the chocolate and beer ice cream was by far the best, a clever thing where the chocolate hit you first and then the malty darkness of the Estrella “Black Coupage” snuck in at the end. The salted butter caramel I found less impressive – it seemed to lack much in the way of salt. Kat liked the caramel shards, I found them a tad unnecessary. Overall I quite liked the ice cream although I wasn’t entirely sure whether I six pounds liked it. The texture, although free of crystals, was gritty rather than smooth and maybe not quite special enough. The glass of dessert wine we had with it – a Banyuls, like a slightly sweeter take on port – was terrific. Lovely, if a little pricey, and consequently both an excellent and fitting way to bring the meal to a close. Dinner for two, including an optional ten per cent service charge, came to one hundred and sixty-six pounds. It’s possible to eat for less, but even if you skipped the gin and the dessert wine it would still have clocked in at over a hundred pounds. This has been a tricky review to write, and it’s a particularly difficult review to conclude. It can’t be denied that the Lido is a fantastic restoration project. What they’ve done with the building is amazing, it looks beautiful and it does make you feel a little prouder of Reading just to see it. And I can easily see that it’s an expensive labour of love, and those costs need to be recovered somehow – whether that’s through swimming, or massages, or packages, or through the restaurant. I’m also aware that practically everything I’ve read about the Lido has been glowing praise, so I stick my head above the parapet with no great enthusiasm to say that, good though it is in places, it’s not quite good enough. The building has a wow factor the food can’t live up to, and everything feels just a little bit too expensive. The service didn’t match the surroundings either. Maybe it would have been different on a night where the dream team of Matt Siadatan (previously of Mya Lacarte) and James Alcock (from London Street Brasserie) were on duty, but as it was everything felt patchy. The restaurant was far from packed, but from the wayward service you’d think they were run ragged. I might consider going again for the set lunch, and I can see that jumping off the train on a summer afternoon and having tapas at the poolside bar could be hugely enjoyable, but as a standalone restaurant it didn’t leave me in any hurry to return. “It’s a real pity, isn’t it?” said Kat. “I was hoping to find THE place in Reading, and I really thought the Lido could be that, but it isn’t.” Let’s not leave the last word to Kat though, let’s leave it to Kat’s pasty. I have it on good authority that she consumed it for a late breakfast at around half-ten the next morning. As a review of the Lido it’s a lot more succinct than what you’ve just read, but it’s as good a summary of the verdict as the number at the bottom.